Paris has for centuries been one of the centres and magnets of the world. When the Romans conquered it in 55 B.C. it was a fishing village on the Seine islands, inhabited by the Parisii tribe. It grew in Roman times and became the capital of France. It grew in Roman times and became the capital of France at the beginning of the Middle Ages. 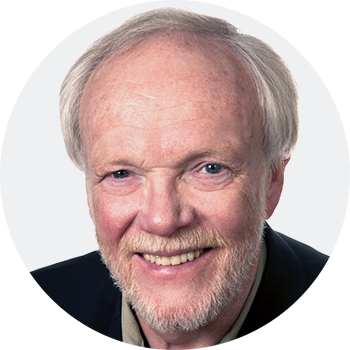 Since then Paris has been the European centre of religion and politics, learning and arts, quickly overtaking Rome and only yielding to New York after the Second World War. Sorbonne is one of the oldest universities in the world and for centuries the most famous one. Paris is rich in monuments from most periods of its history. In spite of that it has not rested on its laurels. It is also famous for modern and avant-garde design, as can be seen at the Louvre pyramid, the Centre Pompidou and the Défense. It all began here. Paris was founded on the islands of Seine and later expanded to the Right and Left banks of the river. 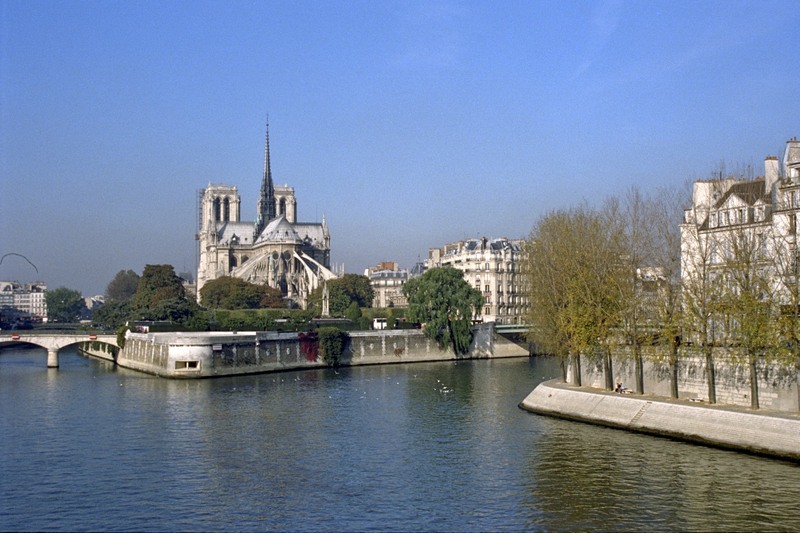 The churches Notre-Dame and Sainte-Chapelle will be the high points of our walk around the two islands, Île de la Cité and Île de Saint-Louis. For the time being we save the former island, the real Paris of ancient times, and begin our walk on the farther tip of Île Saint-Louis, at Pont de Sully. If we arrive by the metro, it is best to get off at the Sully-Morland station and walk across Pont de Sully over to the island. On the way over the Pont de Sully we scan the Île Saint-Louis which architecturally is the most consistent and graceful part of Paris. On the whole this island is a pleasant and a relaxed oasis in the midst of the frenzy of the city centre, almost aristocratically sleepy. Two islands were combined in one and built with mansions 1627-1664, in the golden age of France. These houses of more than three centuries are still standing and turn their refined 17th C. Renaissance Mannerist fronts to the river banks. Behind the massive oak doors are hidden the courtyards of the mansions, or hotels as they are called in France. Originally aristocrats and judges lived here but now there are many well-off artists and retired politicians. The widow of president Pompidou lived here. Emblems in memory of famous inhabitants of former centuries are on many house fronts. Most of the great cities in the world do not succeed in making their rivers a central part of city life. Vienna hides the Donau somewhere in the suburbs and so does Berlin with the Spree. The banks of the Thames in London, Tevere in Rome and Arno in Florence are not rendez-vous points for people. Paris, on the other hand, succeeds in making the banks of the Seine an integral part of city life where people go for a walk, relax in cafés and pursue cultural attractions. Powerful trees give a welcome shade on sunny days and mellow the surroundings. The boxes of antique books appeal to people. Restaurants and cafés jostle for space on the mainland quais. We can start our circular walk on the river banks at any point. 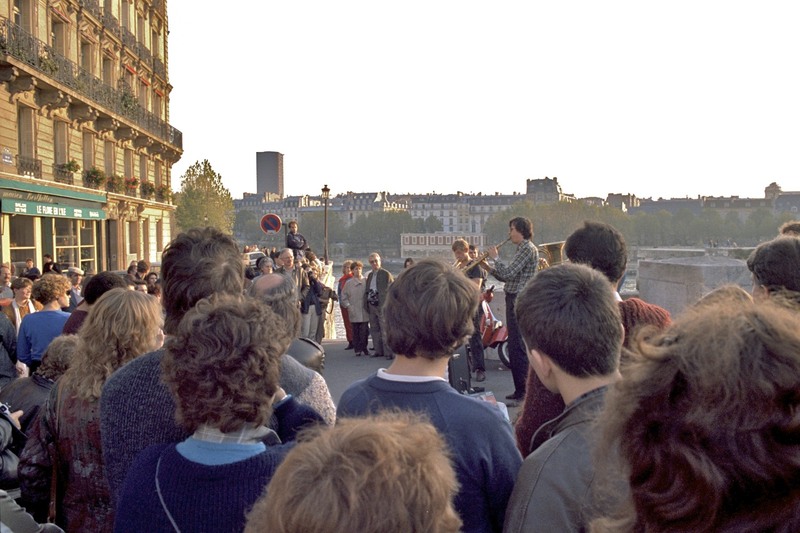 This walk starts at the Pont Neuf metro station at the bridge of the same name. We take in the voluminous Conciergerie and Palais de Justice on the other side of the river. We visited those buildings in our 1st walk. But it is from here that the palace towers look their best. We soon arrive at Place du Châtelet. 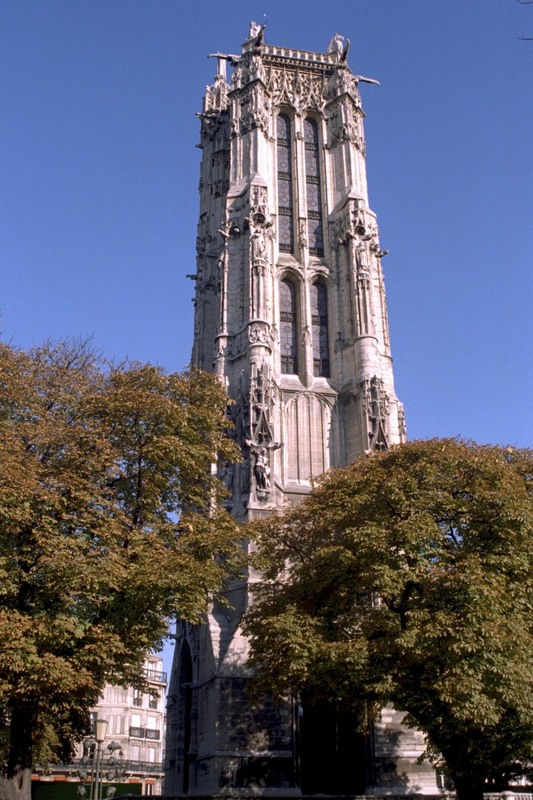 We see to our left the imposing tower of Saint-Jacques from 1523, the only remains of a late Gothic 16th C. church, which was destroyed in the aftermath of the Revolution. A statue of Blaise Pascal is in front of the tower. Well known theatres are on both sides of the square. A little known part of the city centre. The Marais or The Marshes were initially swamps and marshes which the order of the Templars had drained in the 12th and 13th C. Later they became the quarter of Christian societies and monasteries, as can be seen today from some street names. In the 16th C. the nobility began to build mansions here, the so-called hôtels. The district became fashionable at the beginning of the 17th C. when the palaces around Place des Vosges were built. In those years the French Mannerist style of city mansions was developed here. In the 18th C. the aristocracy moved to the west and Marais slowly dilapidated. André Malraux, Charles de Gaulle’s minister of culture, was a restoration enthusiast. He had many buildings cleaned and renovated. One of his most important deeds were the Malraux-laws of 1962. In the wake of them 126 hectares of the Marais have been restored to their original splendour. Since then the Marais have been on the upswing and well-off people have moved in. The main attraction of this walk is the thrilling Pompidou museum in Palais Beaubourg. But first we are making our acquaintance with the Marais. We start our walk at the Pont Marie metro station. From there we walk a few meters along the bank and turn to the left into the first street. There we see the back side of Hôtel de Sens. We pass it to see it from its front side. One of the most important houses of architectural history in Paris, one of two medieval palaces that have been preserved. It was built 1474-1507 for the archbishop of Sens. Its Gothic castle style is obvious in rounded corner-towers, in a pointed arch over the entrance and in tower spires. Access to the palace garden is through the main entrance. This time we are going to look at rather unknown parts of central Paris. On the one hand we shall visit some of the old glass-covered passages and arcades of shopping, which are more typical of Paris than of other cities, especially of the 1st and 2nd districts. Early in the last century about 140 such passages existed in the city, of whom about 30 are still in use today. On the other hand we are to visit the almost secret garden of Palais Royal, which is only a stone’s throw from the Louvre. We start at the Arts et Métiers metro station. First we walk a short distance to the east along Rue Réaumur and turn right into Rue Volta. There on the right hand side we look at house no. 3. 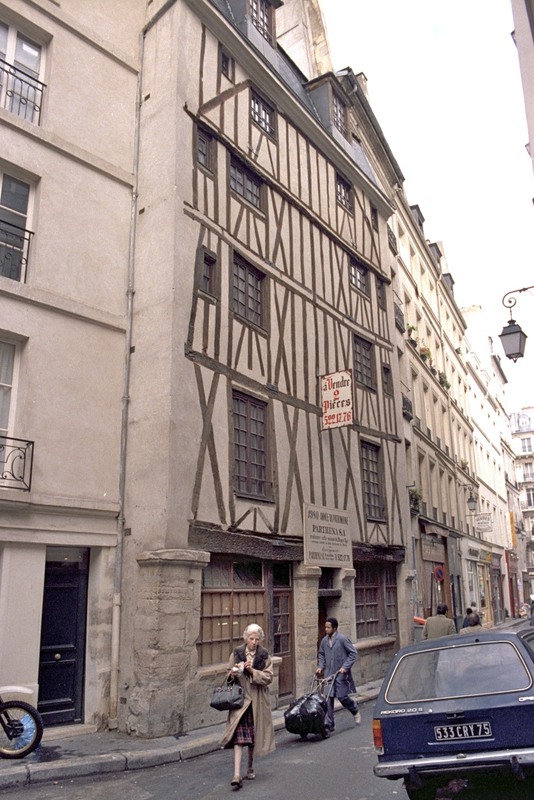 This half-timbered house of four storeys was until recently thought to be the oldest dwelling-house in Paris, built in the 13th or 14th C. In fact it is a 17th C. imitation. In spite of that it is typical of homes from the Medieval times. We can at once start on the next walk, as it starts right here at Comédie Française. Or we can go to the Louvre which is here behind the Louvre hotel. The fashion shops are one of the main attributes of the city. 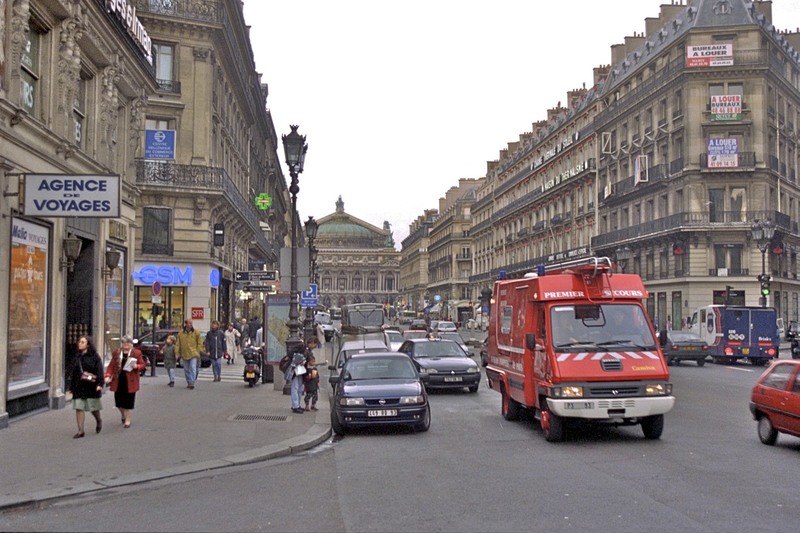 They are concentrated in the area on both sides of Rue de Faubourg Saint-Honoré. Most of the best known fashion houses in the world have their main outlets in this area. On our way through this district we will have a look at the Opéra, the Madeleine and Place Vendôme. We start our walk at Place André Malraux where we finished the last walk. If we arrive by the metro the station is Palais Royal. 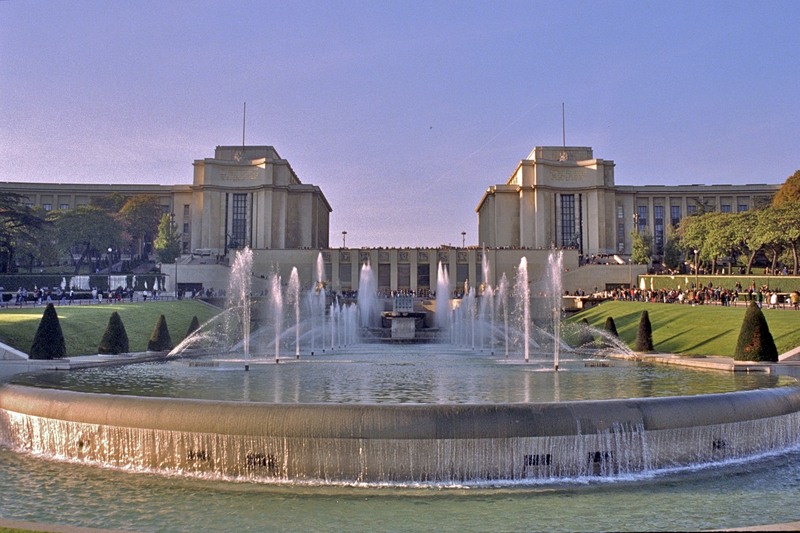 We have a gorgeous view from the square and its fountains up Avenue de l’Opéra. This view we can continue to enjoy all the way to the Opéra. On our way we pass banks, expensive shops and side walk cafés. Haussmann, the city planner of Napoleon III, had many slums razed in the 3rd quarter of the 19th C. to make place for splendid boulevards across the city centre. This is one of the parade streets made at that time. It was finished in 1878. It was considered so important that an hill was removed to level the road. Few if any world cities have such an enormous and successful axis as Paris has in Avenue des Champs-Élysées, a broad and a straight line, not only reaching from Place de la Concorde to Arc de Triomphe, but all the way from the Louvre to the ultramodern suburb of Défense. This is the main traffic artery in the centre, both automotive and pedestrian. It is full of life from morning to night, as cinemas take over when shops close. On national days this axis is perfect for parades. We start at Arc de Triomphe. 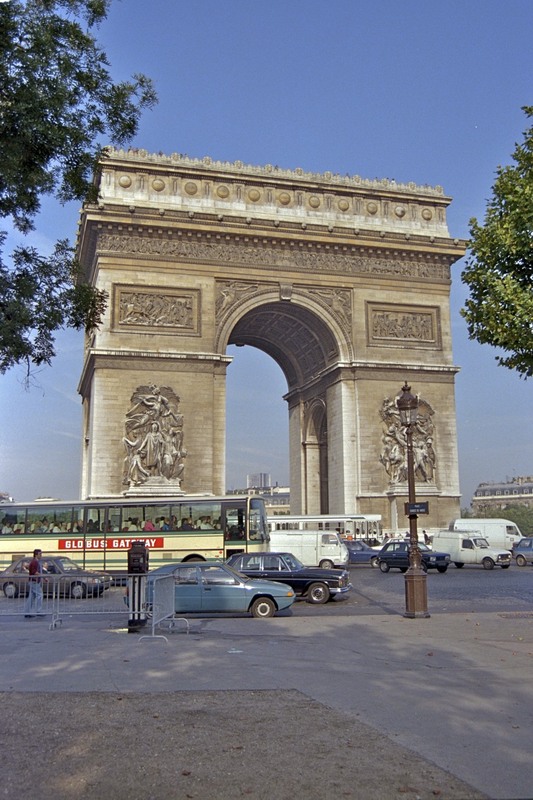 The arch of victory is one of the main landmarks of Paris, along with Tour Eiffel and Notre-Dame. It is the biggest victory arch in the world, 50 meters in height and 45 meters wide. It was built for Napoleon 1806-1836 and offers a unique view over the city. Its exterior is decorated with pictures and names in memory of French military victories. And under the arch there burns the flame on the grave of the unknown soldier. We turn our attention to the surroundings, the Étoile. The enormous plaza around the arch carries the name of Place Charles-de-Gaulle. It is always called Étoile, quite like the Pompidou museum being called Beaubourg and Charles-de-Gaulle airport called Roissy. The French seem not to accept that names of famous people should evict traditional place-names. Étoile is one of city planner Haussmann’s main works, laid out in 1854. Twelve of his boulevards run as sun rays from this circular place. As most of them are busy traffic arteries the plaza itself is the main traffic congestion point in the whole city. 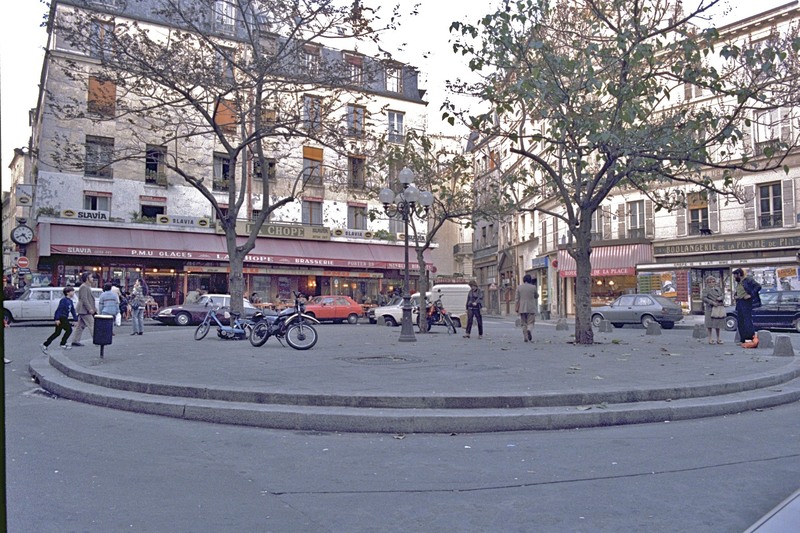 According to French traffic rules the cars entering a circular plaza have the right of way and not those which are already there. Therefore, it is an art in itself to choose a right lane to get out again and to the right boulevard. Étoile is the right place for us to admire the wits of driving Frenchmen. Plans have been around for a while to change the rule for this place. 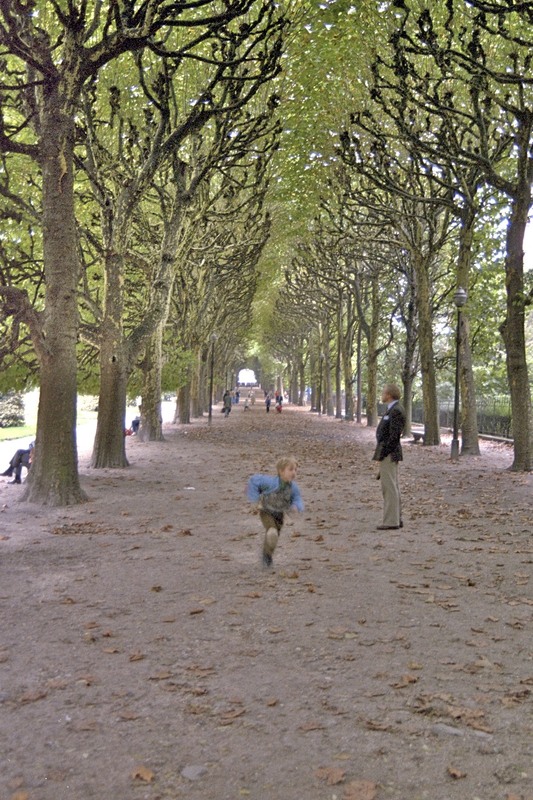 There are some esplanades or green spaces on the Left bank of central Paris in addition to Champs-Élysées and Jardin des Tuileries on the Right bank. There is the Jardin du Luxembourg, the Esplanade and Champs-de-Mars. 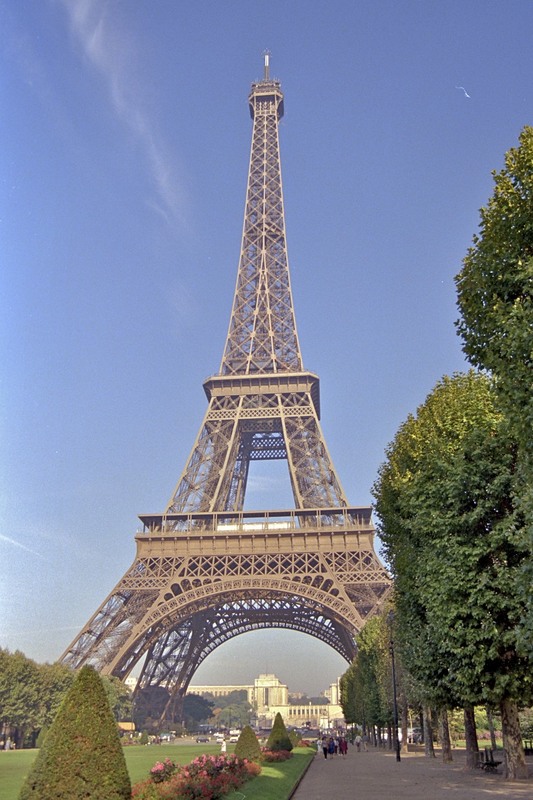 The last two are the subject of this walk, including such landmarks as Palais Chaillot, Tour Eiffel and the Invalides. We start at the Trocadero metro station, in front of Palais Chaillot. The Neoclassic palace was built in 1936-1937 in a Hitler-Stalin version of the style. As it is French it is lighter and milder than other buildings of that megalomaniac period. From the terrace between the two identical parts we see over the garden of Trocadero and the Seine to Tour Eiffel, the fields of Champs-de-Mars and École Militaire. This is the most stunning view in Paris. From the entrance to the northern half of Chaillot we walk down to one of the largest theatres in France, Théâtre National de Chaillot. The same entrance also leads to the French monument museum and the film museum, Musée du Cinéma Henri Langlois. From the entrance to the southern half we get to the maritime Musée de la Marine and the ethnological Musée de l’Homme. At the eastern end of the palace we enter Cinémathèque Française where old films are constantly shown to the public, as is done in Palais Beaubourg. We walk down to the Trocadero gardens. The gardens cover 10 hectares, sloping down to the river Seine, centring on a pool with statues and fountains, which are illuminated in a spectacular way at night. An aquarium is in the left side of the garden. The gardens were laid out in 1937. The liveliest part of Paris is the area around the boulevards Saint-Germain and Saint-Michel on the Left bank. On our way we will also pass landmarks like the Panthéon, Palais du Luxembourg, Saint-Sulpice and Saint-Germain-des-Prés. This is our longest walk as there are many things to see. We start at the lower end of Rue Mouffetard, in front of the 15th C. Saint-Médard. If we arrive by the metro, we depart at the Censier-Daubenton station and walk along Rue Monge for a few meters to the church. We walk up Rue Mouffetard. 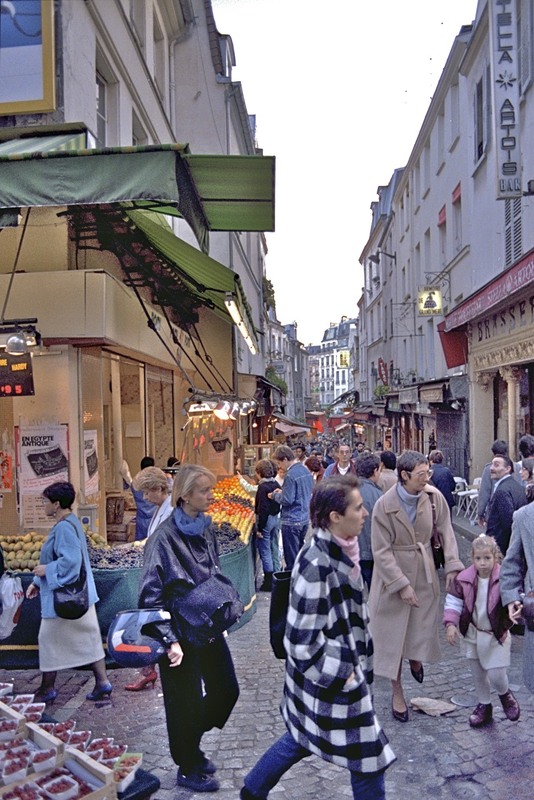 The most charming shopping street in central Paris is this pedestrian street which meanders down Montagne Saint-Geneviève from Place Contrescarpe to Saint-Medard. The liveliest part is the downhill one near the church, especially in the morning. We note Flahec, a nice little seafood shop, at no. 135. From no. 104 and 101 pedestrian passages lead off the street. The houses are old and village-like. Many shop-signs are from olden times. The street itself is narrow, filled with stalls and humanity. Everything is for sale in La Mouffe, as the local people call the street, but food is the most obvious thing. We arrive at the top of the street to Place de la Contrescarpe. Resembling a small-town square, it was laid out in 1852 in a place that had been used for festivals for a long time. It is now livelier than ever, lined with restaurants and cafés that cater to university students. This walk leads us through the Latin district or the district of university colleges, such as the Sorbonne and the Collège de France, which forms the northern part of the 5th district. We are also seeing many historic buildings. We start by going to Jardin des Plantes. If we arrive by metro, we leave it at the Gare d’Orléans station and walk back to Place Valhubert beside the Seine, where there is the main entrance to the botanical garden. A good place for relaxing. It includes a small zoo on our right and the Museum National d’Histoire Naturelle at the far end to the left. The garden is famous for having been open to the public since 1650. We saunter through the garden and leave through the gate at its north western corner. When we have spent four or five days to see central Paris we can begin to think about nearby places. We can forget Montparnasse which is finished. But Montmartre is still worth a visit. The hill, which the locals call Butte, with the famous Sacré-Coeur, was in the 19th C. the artists’ quarter of Paris. What remains there is a centre of fake art for tourists. And under the hill, around Pigalle, the most boring part of Paris night life is located. 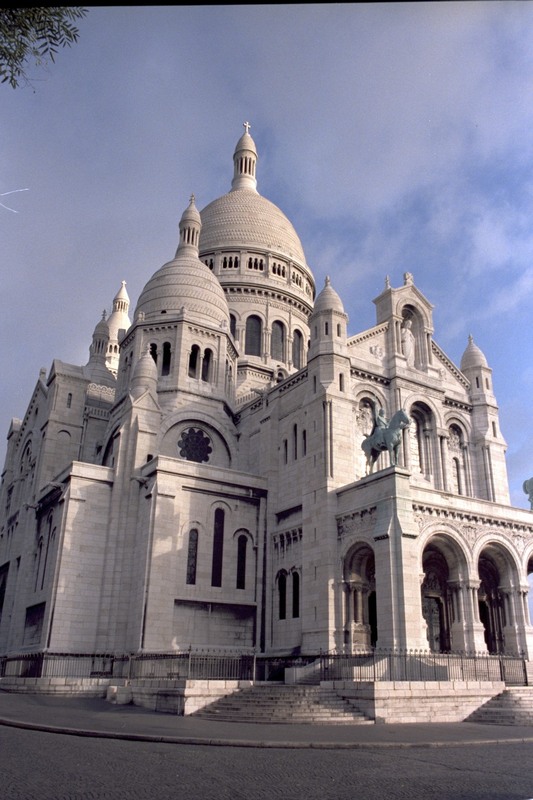 We start by climbing the steps up to Sacré-Coeur or take the funicular uphill. We get there from the Angers metro station in Boulevard de Rochechouart by walking north Rue de Steinkerque. Or from the Abesses metro station by walking Rue de Tac and Rue Tardieu. Built in a cake-and-cream style 1876-1914. Its fame derives from its singular location and from its white stone of Château Landon which gets whiter and whiter with age. It is formed as a Byzanthian crucifix church with one big dome in the middle and additional four on the corners. The view in front of the church is truly spectacular. 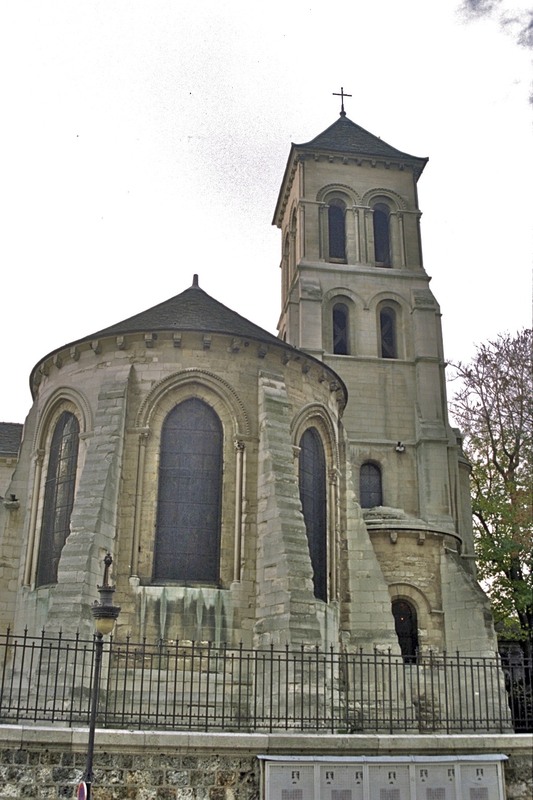 One of the oldest churches in Paris, from the first half of the 12th C. The building was finished in 1147. It has Romanesque column capitals but is otherwise Gothic in style. Organized bus tours leave for Versailles. It is also possible to take a train from Gare des Invalides or rent a car. The trip is short. 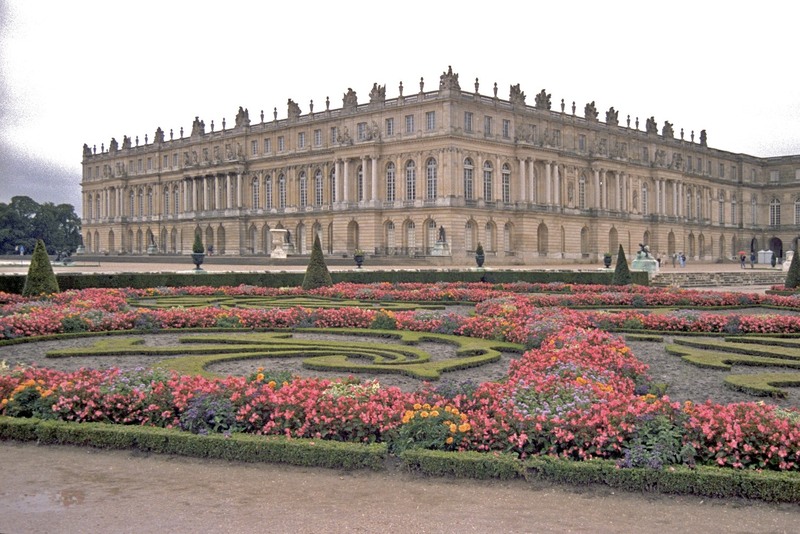 Versailles are only 24 kilometres to the south west. Soon after its construction it became a model for other royal palaces around Europe. The style is called the Versailles style, a development out of the French Mannerist palace or château style. In 1660 the Sun king, Louis XIV had construction begun at Versailles. He wanted a royal residence away from the Paris mobs. At that time it was the hunting palace of his father. The first architect was Le Vau, but after his death Hardouin-Mansart took over and was responsible for the final look, the consistent style of the palace. As examples of the scope of the construction it can be mentioned that 36,000 men worked with 6,000 horses. 16,000 hectares were drained and 1,400 fountains were built. 150,000 trees were planted each year. The palace was meant to house the king’s family, 1,000 aristocrats and their 4,000 servants. The main attraction is the hall of mirrors, running almost the whole length of the garden side of the central wing, 75 meters long, with 17 big windows out to the gardens and 17 equally big mirrors on the other side. The hall was initially furnished in silver but now it is empty. In olden times noblemen relieved themselves in the crannies, making the whole palace stink. The hall of mirrors connects the King’s wing on the north and the Queen’s wing on the south. Other outer wings extend from these wings. The northernmost one houses a chapel and a theatre. The palace is now a series of museums. Visiting hours are variable, so it is advisable to check beforehand. Waiting lines can be long when buses arrive in force. In such cases it might be wise to have a rented car and choose a more convenient hour, for example at opening time in the morning. We finally enter the gardens of Versailles. The gardens cover 100 hectares. They are in classic French château style, designed by the architects of the palace. We have a good view over them from the terrace in front of the hall of mirrors. In the northern part of the gardens there are the palaces Grand Trianon and Petit Trianon, summer residences. Near to them is a fake Alpine village which Queen Marie Antoinette had built for her and her ladies-in-waiting to play Austrian milkmaids. Finally we return to Paris.